As many Jeep fans are starved for details about the upcoming Jeep (JL) Wrangler, the Jeep Safari Concept may offer a few tantalizing clues. 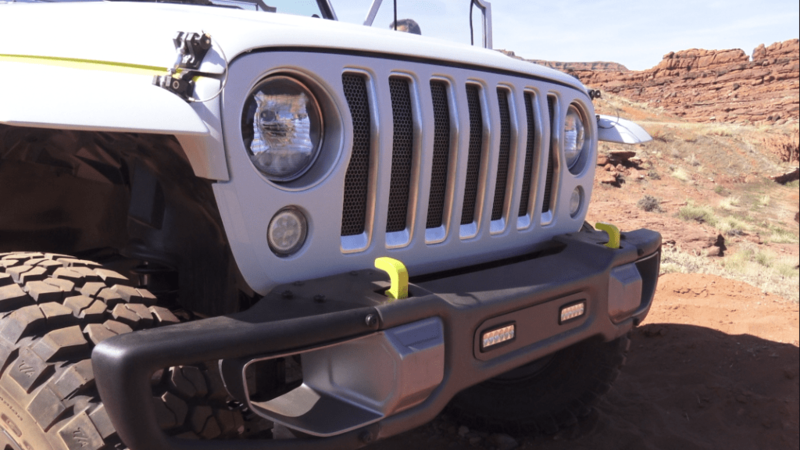 The grill and front bumper certainly look like they belong on the next Wrangler, but there’s a lot more to the Jeep Safari Concept than hints to the JL, it is a slick and absurd idea rolled into a great looking rig. The roof is a translucent plastic-like material and it supports a faux drone that sits over the rear on its own launch pad. The “windoors” are clear plastic vinyl laid over custom aluminium brackets. Zippers line the window section and the rear doors are rear-hinged (suicide-door-style) and give a great opening to the rear seats. By the way, the two rear seats are similar to the front seats, but they are canted slightly outward for better safari viewing pleasure. … and, by the way; the one thing that excited many journalists was the front windshield which is raked 3-degrees. We think this is off of the Jeep Wrangler JL. Still, like the steering wheel, which was sourced from a Fiat 500X, it may be something else. This year’s TFL coverage of the 2017 Easter Jeep Safari is brought to you by Blackforestgear.com. Check out their web site for unique Jeep soft tops and other fun Jeep wheeling gear. It’s a fun vehicle to drive, even if the future clues prove false!